What inspired you to write a historical fiction novel, that too set in 1857? What drew you toward that time? The novel was actually very much inspired by a visit to the Humayun’s Tomb and Gardens complex in 2003 – before it was restored by the Aga Khan Trust for Culture. At that time I was living in Uzbekistan, directing a human rights project. I had just visited Ferghana – the birthplace of Babur and Samarqand and Bukhara are both also in Uzbekistan so the Central Asian/Timurid/Mughal civilization was already playing in my imagination but for some reason I was not really expecting to find that in India so when I visited Humayun’s Tomb I was kind of blown away at how beautifully this heritage had married with the civilization of the Indian subcontinent to create this breath-taking architecture. So I wanted to try to capture some of that. I’ve also always been fascinated by the Sepoy Mutiny of 1857 – Ghadr. It was actually the first serious challenge that the British East India company faced by the people it had colonized. Bahadur Shah Zafar thankfully isn’t made a caricature of in the book. What kind of research went into ensuring that more facets of his personality came to light? How did you manage to translate that or incorporate it in the book? I did a lot of research and I read his poetry. I visited the National Archives in Delhi where I also found a lot of information. He impressed me and I tried to understand him as a poet and a mystic rather than a ruler. Laale is headstrong, independent, and yet has to adhere to the societal constructs of that time and age. What were the courtesans like in that period? It is certainly true that there were societal constructs for women at that time, as there are today – however they are not always what we imagine them to be. Courtesans were often quite empowered as women. They were educated and erudite, they moved and circled in public spaces, often in male domains where they would have to hold their own among Nawabs and Mirzas. They were also not merely sexual slaves – many courtesans were respected women who came to wield a fair amount of power at court. Beghum Samru for example was a nautch girl who ended up becoming the head of a professionally trained army. Or Mah Laqa Chanda who became the first Urdu poetess and whose Divan is currently at the British Library in London. How is Laale different and how was it like to place her in around 160 years ago, though she could very well fit in today’s time and age? It is funny you should ask that because The Mulberry Courtesan was originally about two women Laale and a contemporary women who is like her mirror or soul mate. 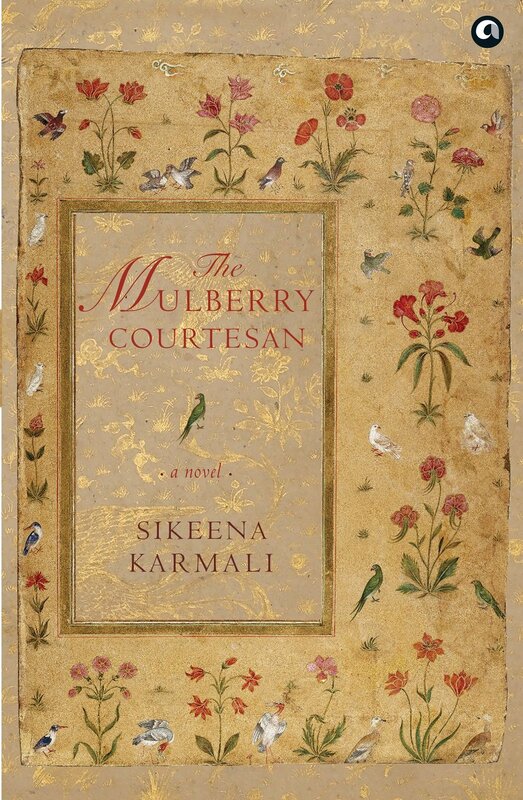 So that contemporary story is now going to be The Mulberry Courtesan Book Two. The book moves between multiple nations and times. How easy or difficult was it to write about that? That is actually how the book unfolded so it’s how I wrote it. At the time that much of the book was written, I used to travel quite a lot so it didn’t feel unusual for me. How is it to bring the interactions to life in a historical novel, given the context and plot? How does that work? Is it any different from say setting the novel in the 21st century? I’m an avid student of history so it’s quite normal for me to be inhabiting another century in my imagination while I go about my daily existence in the 21st century. I think with historical fiction writing you really have to take the time to set the scene, to illustrate the details that will really transport your reader to another time and place. I have just finished Daughters of the Sun by Ira Mukhtoy and I am in the middle of Do Not Say We Have Nothing by Madeleine Thien which is really lyrical and beautifully written. This entry was posted in 2018 Interviews, 2018 Reads, Aleph Book Company, Author Interviews, Books, historical fiction, Interviews, July 2018 Reads, Literary Interviews and tagged 2018 Reads, Aleph Book Company, historical fiction, interview, July 2018 Reads, literary, Sikeena Karmali, The Mulberry Courtesan on October 30, 2018 by thehungryreader. Because more stories such as this one need to be told. Stories where the political and personal merge and the voice stands out – being original, fearless and saying it like she intends to. I also most certainly have come to believe that stories of women are best told by women (you can refute me on this one but it is my opinion nonetheless). The story of Tahira in 1970s Karachi is told beautifully by Sadia Abbas. Through a work of fiction, you can sense the tone and emotions that are so real, you are transported back in time. As a reader, I was way too invested in this book and just wanted to see Tahira happy, no matter what. Like I said, the novel is set in the 70s of Karachi. Tahira is married off quite quickly to someone she doesn’t know and her life falls apart as quickly. She is a talented painter who isn’t allowed to paint. Her marriage is nothing but a trap and she has no voice left. She was always the free one at her parents house – interacting, debating, discussing with her brother Waseem and his friends. She misses all that and comes to know one fine day that her brother and his friends are arrested and caught up in the regressive regime’s line of fire. Tahira’s world is shattered. She doesn’t know what to do and how to express herself anymore till she goes back to painting. All her paintings have the same title, “The Empty Room”. “The Empty Room” is rich, luxuriant and more than anything else soothing in so many ways. I often found myself weeping and smiling at the same time while reading this book. The nation is new. The bride is new. Her roles are new. There is the rebel inside her which refuses to succumb and Abbas through her succinct prose has brought out all the elements and joined them quite cleverly. Yet, there are so many places where the book just is – it doesn’t try to be anything but show a mirror of times gone by and strangely you can see those times even today around you. They haven’t gone anywhere. The regressiveness exists, doesn’t matter which nation. Abbas makes Pakistan come alive in this book. The streets, the places, the houses – the very atmosphere that is heavy and sometimes claustrophobic in Tahira’s world is described brilliantly. “The Empty Room” is just an introspective book with a lot of heart, gumption and the idea and hope that things will change for the better. Read it. This entry was posted in 2018 Literary Reads Project, 2018 Reads, 2018 Women Writers Reading Project, 500 Must-Read Literary Fiction, Books, contemporary fiction, historical fiction, July 2018 Reads, Literary Fiction, Literary Reads 2018, Political, women writers, Women Writers Reading Project, Zubaan and tagged 2018 Reads, contemporary fiction, historical fiction, July 2018 Reads, literary, literary fiction, Literary Fiction Reading Project, literature, Pakistani, politics, Sadia Abbas, The Empty Room, women writers, Women Writers Reading Project on July 26, 2018 by thehungryreader. At the very onset, let me tell you that “Disoriental” is not an easy book to read. I think most literary fiction isn’t. You have to give the genre some time to grow on you and once it does, there is no looking back. Having said that, the reading experience differs with every book. The thing with “Disoriental” is that (and to me, this was important while reading it) it is written in French (the adopted country of the author) and not in the author’s native language Farsi. This in itself says so much about the book and its progression. The readers are in for a treat when it comes to this book. From a modern-day fertility clinic, we are transported to modern Iranian culture and in the bargain the history of a country. Might I add that there are magic realism elements as well that take your breath away, even if you have read Márquez or Rushdie. Kimiâ Sadr fled Iran with her mother and sisters to join her father in France, at the tender age of ten. She is now twenty-five, in a fertility clinic waiting for her turn and memories come rushing by. I love how Djavadi has integrated the personal and the political. It is as if they are intertwined and to a very large extent maybe they are. The past, present, and future of the country of birth will somehow in so many ways, will always be linked to ours, whether we choose to acknowledge it or not. The Sadrs are a flamboyant lot – from Kimiâ’s formidable great-grandfather to her father and uncles. Not to forget her mother from whom she was greatly inspired. “Disoriental” besides being a book on identity, exile, and homelessness, is also a book on a family in the midst of political upheaval and regime change. Iran is described on point (not that I have been there but can figure, only going by movies I have watched and other books I have read) and there is mention of “THE EVENT” of March 13, 1994, which is spoken about throughout the book and revealed with a feeling of horror toward the end. The thing also about “Disoriental” is that it feels as though it has come from a very personal space, almost autobiographical and maybe it is. Family looms large in the narrative and plays along beautifully alongside, combining the personal and the political. Also, not to forget the sexual. Kimiâ’s sexual identity is also explored which I thought was much needed. “Disoriental” is about distances and perhaps also about the ones we do not sometimes want to traverse. It is about alienation and somehow feeling grounded wherever you are, in a very strange manner. The tone and voice of the narration keep changing in the book, which to me made it jumpy and out of the flow. Having said that, it was needed to give background about characters and the place they came from. There are multiple journeys in one book – they run parallelly to each other and the author uses deep, lyrical sentences that give it the much-needed elegance. At the same time, to understand that all of this is translated into English makes one be in awe of Tina Kover, given how dense the book is. There is a lot of thread of memory – through objects, people, place and time (you will keep reading about THE EVENT a lot by the way), lending it the Proustian quality (I wasn’t surprised at all). All I can say is that “Disoriental” is a book that has so much to offer, and does it in a lot of ways and stupendously at that. This entry was posted in 2018 Reads, 2018 Women Writers Reading Project, 500 Must-Read Literary Fiction, Books, europa editions, Europa Editions Reading Project, family saga, historical fiction, June 2018 Reads, Literary Fiction, women writers, Women Writers Reading Project and tagged 2018 Reads, europa editions, Europa Editions Reading Project, family saga, historical fiction, June 2018 Reads, literary fiction, Literary Fiction Reading Project, Women In Translation, women writers, Women Writers Reading Project on June 13, 2018 by thehungryreader. The year is 1785 and merchant Jonah Hancock has to cope with the tragic news that one of his captains has sold his ship in exchange for a mermaid. Sounds intriguing, isn’t it? I was sold at this premise. But wait a minute. There is more to this story which is more fascinating to me. The side story of Angelica Neal that quickly comes to fore. Neal is London’s most beautiful courtesan who wants to marry rich and secure a future for herself. And who better than Mr. Hancock who has a mermaid to be put on display and make easy money? And all of this is possible through Mrs. Chappell’s brothel (there is more to what meets the eye really) and given she has a soft spot (or so it seems) for Angelica. Phew! That is not it by the way. There is a lot more going on in the book and let me tell you, that despite its size (500 pages), this is one racy romp of a read. There is a lot of decadence in this book (which I love by the way), there is misery, power, envy and fantasy. If not for the mermaid angle, I would classify this book purely as historic fiction, but let the two merge and work its magic on the reader. Also, might I add the magic of London (and its claustrophobia, its stench, lecherous men and grotesque women) is brought out beautifully by Gowar. Angelica Neal’s character is so strong that she overpowers everyone else (in some bits and parts) and in a very good way because you’d want her to appear more as the book progresses. There is also a surprise in the form of Polly but I won’t ruin it for you by talking about her. You might want to discover her yourself. “The Mermaid and Mrs. Hancock” is set in a vivid and uproarious time. It is the kind of book that must be read again and more than anything for its female characters that stand out and well-deservedly at that. Mrs. Chappell, Angelica and Polly (there is also Mr. Hancock’s niece who makes a brief appearance) are the heroes of this book in all honesty. This is the kind of book that will keep you up all night and you wouldn’t want it any other way. “The Mermaid and Mrs. Hancock” is all rolled into one – a comfort read (yes, at most times) and a thriller, literary fiction with the much-needed historic setting. This entry was posted in 2018 Reads, 2018 Women Writers Reading Project, 500 Must-Read Literary Fiction, Books, fantasy, February 2018 Reads, historical fiction, Literary Fiction, Literary Reads 2018, women writers, Women Writers Reading Project and tagged 2018 Reads, Fantasy, February 2018 Reads, Harvill Secker, historical fiction, Imogen Hermes Gowar, literary fiction, penguin random house, random house, Random House UK, The Mermaid and Mrs. Hancock, women writers, Women Writers Reading Project on February 20, 2018 by thehungryreader. The times we live in aren’t easy. We live in xenophobic times. As much as I hate to say it, it is true and we cannot turn a blind eye to this one. In these times, as much as I don’t want to read what stares in my face all over the place – on Twitter, on FB, on almost every social media – hatred for a religion or class, or a set of people that aren’t yours, but you read because you feel you will understand and empathize better and this is the time “The Best We Could Do: An Illustrated Memoir” came into my life. This is a graphic memoir, which means it happened to the author and her family – a set of events – after her parents moved to the land of milk and honey from Vietnam on a boat. The story is deceptively simple but layered with relationships issues, immigration and belonging issues and above all: what it really takes to blend in? Do people who come from outside can after all be called citizens of a particular country even after decades or do they have to keep proving themselves and their patriotism over and over again? Bui’s story is the story of her family – as she begins to adjust to being a first-time mother, she reminiscences what it means to be a parent from her parents’ perspective – from the sacrifices to unnoticed gestures to love that need not be spoken all the time. In all of this is America – Grand Old America in the background (not as much) always making them question their identity and the importance of home. There are panels that are so breathtakingly beautiful and how they mingle with the prose – will make you weep and in the next panel before you know it you are smiling and cheering on for Thi and her circumstances. This book as Viet Thanh Nguyen claims will break your heart and then heal it – did just that for me. What is funny is that I also spoke to my maternal aunt after reading this book to know her memories of coming to India from Pakistan during the Great Partition and what it was like for them. “The Best We Could Do” as the title suggests is just that – the best they did and how sometimes you have to keep doing your best to find your place in the world. This entry was posted in 100 Must-Read Graphic Memoirs, 2017 Reads, Authors I Love, Books, Immigrant Stories, July 2017 Reads, Review, Vietnam and tagged 100 Must-Read Graphic Memoirs Project, 2017 Reads, america, Biographical Fiction, Emigration, Graphic Memoir, Harry N. Abrams, historical fiction, Home, identity, immigration, July 2017 Reads, The Best We Could Do, Thi Bui, Vietnam on July 3, 2017 by thehungryreader.